LOS ANGELES, Aug. 9, 2018 /PRNewswire/ -- In recognition of upcoming National 811 Day on Aug. 11, Southern California Gas Co. (SoCalGas) raised its 30-foot-tall giant shovel at the OC Fair, where it will remain through Sun., Aug. 12 to bring awareness to the importance of contacting 811 to have utility lines marked by a professional before digging. Designated by the Federal Communications Commission (FCC), 811 is the national phone number that connects professionals and homeowners who plan to dig with a local call center that then sends professional utility technicians to mark the location of utility lines. According to data collected by Common Ground Alliance (CGA), an underground utility line is damaged once every 6 minutes nationwide because someone decided to dig without first calling 811. In 2017, SoCalGas recorded nearly 3,000 cases of damage to underground infrastructure caused by residents and contractors who did not call 811 prior to digging. Data shows, however, that when customers call 811 before digging, the likelihood of hitting a utility line is decreased by 99 percent. In 2017, approximately 15 percent of all accidental line strikes occurred in Orange County, the most of any region in SoCalGas' service territory. "Across SoCalGas' service territory, about 60 percent of pipeline damage is due to digging by homeowners, contractors, and excavators who did not call 811 before they started digging," said Rodger Schwecke, SoCalGas senior vice president of gas transmission, storage, and engineering. 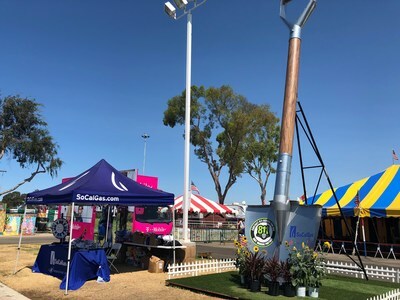 "We hope that by having our giant shovel here at the OC Fair customers are reminded that every digging project – no matter how big or small – warrants a call to 811, and since it's a free service, there is no reason not to call." In addition to providing safety-related information and a free reusable canvas tote bag to visitors who stop by SoCalGas' booth, the utility is holding a photo contest on Aug. 11 for SoCalGas customers who post a photo of themselves with the giant shovel to Facebook, using #bigshovel. Contestants will earn a ticket to be entered into a raffle for the chance to win an $811 Visa Gift Card. The winning ticket will be drawn at 8:11 p.m. on Sat., Aug. 11 by Lieutenant Pat Rich from the Orange County Sheriff's Department. Photos of the 30-foot giant shovel at the OC Fair are available here. Remember that SoCalGas uses yellow paint to mark its lines. Report any pipe damage – no matter how big or how small – by calling us immediately at 1-800-427-2200. Raising the community's awareness of public safety issues, like practicing safe digging, is just one way SoCalGas works hard to keep its customers safe. From 2011-2016, SoCalGas invested nearly $6 billion to upgrade and modernize its natural gas system, and SoCalGas bills continue to be among the lowest in the nation. Natural gas continues to rank among the most affordable sources of energy. More than 90 percent of residents use natural gas for heating, hot water, cooking, drying clothes, or other uses. Headquartered in Los Angeles, SoCalGas® is the largest natural gas distribution utility in the United States, providing clean, safe, affordable and reliable natural gas service to 21.8 million customers in Central and Southern California. Its service territory spans 24,000 square miles from Fresno to the Mexican border, reaching more than 550 communities through 5.9 million meters and 101,000 miles of pipeline. More than 90 percent of Southern California single-family home residents use natural gas for home heat and hot water. In addition, natural gas plays a key role in providing electricity to Californians—about 60 percent of electric power generated in the state comes from gas-fired power plants.